Although you'll see many popular and lovely headstone inscriptions in your local cemetery, these typical choices don't work for every person. If you're looking for something to truly honor a unique loved one, you may need to come up with a more creative alternative. From song lyrics to funny verses, the ideal memorial is out there. The epitaph, or inscription on a headstone, offers a lasting memorial to the person who has died. Because this inscription is so important, it can be difficult to find something that fits your loved one. Depending on your loved one's personality and sense of humor, one of these ideas might be perfect. Words aren't the only way to express your love for a friend or family member on the person's headstone. You can also give your stone a custom look by working with an artist. Businesses like Karen Sprague Stone Carvers and Roy Dixon, The Monument Artist offer unique picture-based inscriptions. From an image of your lost loved one to engravings of the things she loved, this can offer cemetery visitors a real glimpse of the person. If your loved one was famous for her sense of humor or loved to joke about a particular topic, you can always include this quality in your inscription. A funny inscription can be a very meaningful way to honor your family member or friend; however, it's important to make sure that everyone who cares about the person will find the message funny. 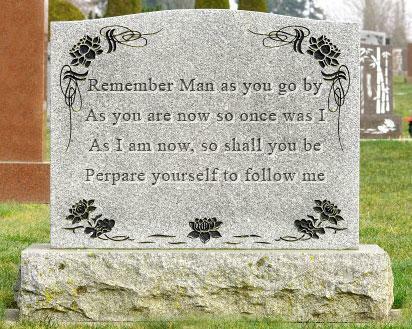 These funny headstone sayings can offer inspiration. Some people choose to write their epitaphs while still alive. This can be a very personal choice. However, if your loved one didn't make her wishes clear, you can read through old letters to find something that represents the person's voice. Expressions of love or other personal notes can be a great way to immortalize a friend or family member. Did your loved one have a favorite song? You can have a portion of the lyrics engraved on the headstone. If possible, choose a part of the song that describes the person. However, if you can't find a verse that's quite right, the chorus is always a good choice. Anyone familiar with the song will understand that it was meaningful to your loved one. What would you say to the person if you could? What are some of the unique qualities that made your loved one special? What would you like others to remember about your loved one? You can also work with a professional writer to create a personalized epitaph. Contact your local college or university for suggestions of creative writers who may be able to help. Is there a restriction on the size of the stone? This can affect the length of your epitaph. Are there verses or topics that are not allowed? Who has final approval of the headstone? Can you speak with that person about your ideas? The engraving you choose for a headstone is a very special statement about someone you have loved and lost. Whether you honor your loved one with famous words, an artist's engraving, a funny statement, or another creative option, you can be sure the words you choose will be meaningful.